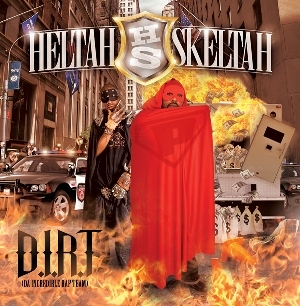 On September 30, Brooklyn duo Heltah Skeltah will reunite for D.I.R.T. (Da Incredible Rap Team). Set for release on Duck Down Records, it’s Rock and Ruck’s first album together since 1998’s Magnum Force. Although the two haven’t issued a Heltah Skeltah project in a minute, the two have been busy. While fighting an attempted murder charge, Rock recently issued a mixtape, Shell Shock. Meanwhile, Sean Price (a.k.a. Ruck) continues to work on his third solo album, Mic Tyson. “We didn’t try and get cute with this album and pick some ‘out da box’ beats and get on some philosophy sh*t. We did what we knew best and that was rhyme about the street, while of course infusing the humor that you know you’re going to get when you listen to our rhymes,” says the ever-forthright Sean Price in a press release. Guest appearances on D.I.R.T. come courtesy of Duck Down fam such as Buckshot and Smif N Wessun; beats arrive via Marco Polo, Evidence from Dilated Peoples, Khrysis from the Justus League and others. This entry was posted in News and tagged Duck Down, Heltah Skeltah, Ruck, Sean Price. Bookmark the permalink.